You know you are in good company when a group full of middle aged women in applique vests, young eco-hipsters (like myself), and old men who rent greenhouses for the winter can share a potluck dinner while passing around gifts of worm poo while the mistress of ceremony tells stories about her lifelong passion for compost and childhood trips to the circus to pick up elephant manure. 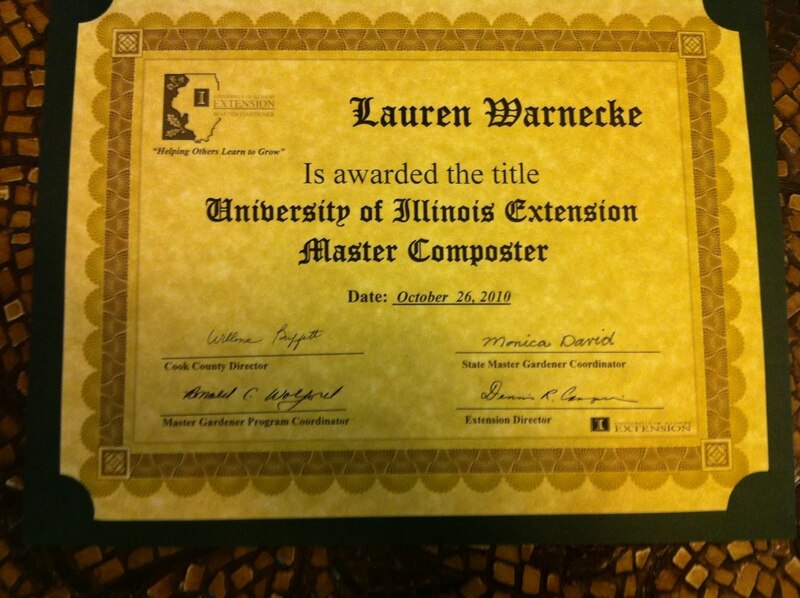 Last night I proudly and officially assumed the title of Master Composter. So far I think it’s safe to say the I’ve used this title much more than the one for which I owe the US government an ungodly amount of cash. The MC program was something I did on a whim, but in hindsight it was exactly what I was looking for to engage a change of lifestyle, and perspective. I met new people who are doing incredible things to conserve our resources and reduce waste. Without this program, I wouldn’t look at garbage and wonder if my worms can eat it; I wouldn’t want to make things from scratch, or clean things with vinegar, or mend old clothes instead of buying new ones. Next Next post: WWLID: What would Laura Ingalls Do?